Weather Desktop Background could be a complimentary tool for Aero Weather, a program that I have reviewed earlier here at Ghacks. Aero Weather changed the Aero color based on the weather conditions. Weather Desktop Background basically does the same for the desktop wallpaper. 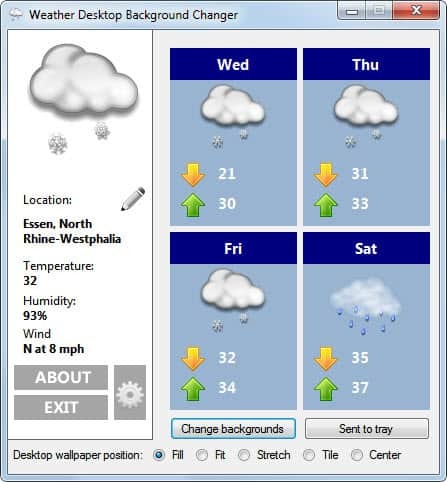 The program changes the desktop wallpaper based on the weather condition so that you know them on a glance and without having to look up weather reports online. How does it work? It begins with a download of the program from the developer page. The program is portable and can be started right after it has been downloaded and unpacked on the system. It neds to be noted that the program will only work on Windows 7 (and probably Windows Server 2008 R2). You then select a location of the world as your weather report source, which usually is the location you are living in but you are free to pick any place you are interested in. Once you have selected the location you need to add images for each possible weather condition in the program. If you do not, you only get a black desktop background with text that is referring to the current weather condition in the selected location. This can take some time considering that the program lists 31 different weather conditions for which you need to add a unique background image. 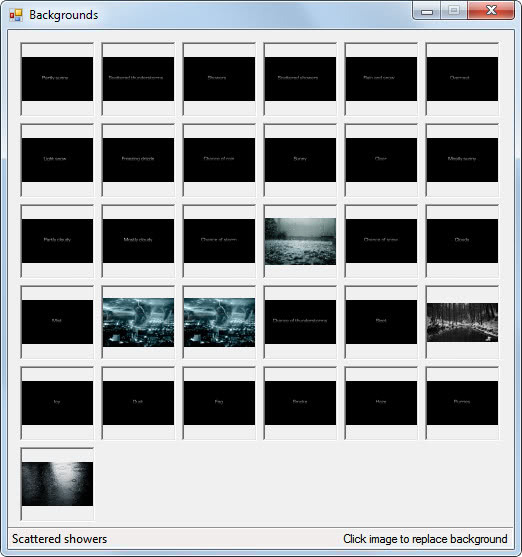 Images are added by clicking on a weather condition and selecting an image from the local system. The program offers no options to change the temperature from Fahrenheit to Celsius or the wind speed from mph to km/h which feels like an oversight. I just installed the tool and there actually IS a function to change the temperature from Fahrenheit to Celsius and the wind speed from mph to km/h. You have to click on the gear next to the about and exit buttons and select Metric. Very nice indeed. Works fine in The Netherlands and because the weather here changes a lot, I see a lot different wallpapers every day. As Mirko B. says: there is a possibility to change from Fahrenheit to Celsius en mph to km/h. so no worries for people who work with Celsius and km (like me). Hi, I developed a new weather SW that is able to change your desktop image according to weather conditions and time of day.